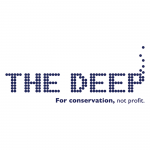 Hull’s award winning aquarium, The Deep is an education and conservation charity and as such, conservation is at the heart of everything we do. It is because of our loyal visitors that we are able to carry out vital research and conservation work, both in-house, in the UK and right across the world. The Deep team are passionate about protecting the oceans and the species that live within, so our projects all focus on the aquatic environment. From protecting endangered penguins in Antarctica, to monitoring Manta Ray populations in the Red Sea, our dedicated team of Aquarists are carrying out pioneering work. The Deep also helps to raise public awareness of marine conservation issues of national and global significance. You too can help make a difference, by even the simplest of things – turning off the tap when you brush your teeth, switching to low energy lightbulbs, buying sustainable fish or taking part in our beach cleans. It is safe to say that The Deep is much more than just an aquarium. Our strapline ‘For Conservation, Not Profit’ states simply what our ethos is. At any one time, we have multiple research and conservation projects up and running. You can find out more about our current research schemes and also past research schemes in this section.